You probably have no experience with this in real life. Holding a light farther from the surface in reality does not make the light brighter. 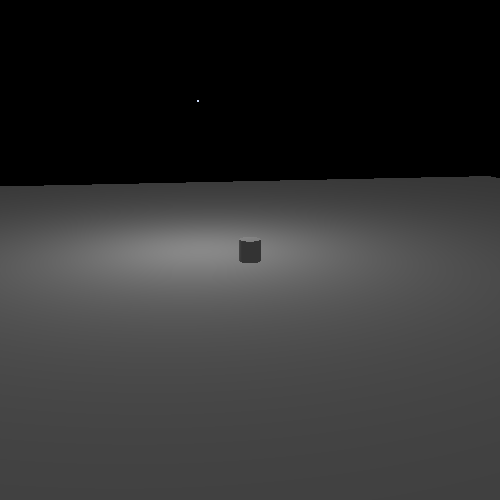 So obviously something is happening in reality that our simple lighting model is not accounting for. In reality, lights emit a certain quantity of light per unit time. For a point-like light such as a light bulb, it emits this light radially, in all directions. The farther from the light source one gets, the more area that this must ultimately cover. Light is essentially a wave. The farther away from the source of the wave, the less intense the wave is. For light, this is called light attenuation. Our model does not include light attenuation, so let's fix that. There is a constant in the equation, which is used for unit correction. Of course, we can (and will) use it as a fudge factor to make things look right. This equation computes physically realistic light attenuation for point-lights. But it often does not look very good. The equation tends to create a sharper intensity falloff than one would expect. It looks brighter at greater distances than the physically correct model. This is fine for simple examples, but as we get more advanced, it will not be acceptable. This solution is really just a stop-gap; the real solution is one that we will discuss in a few tutorials. However, there is a problem. We previously did per-fragment lighting in model space. And while this is a perfectly useful space to do lighting in, model space is not world space. We want to specify the attenuation constant factor in terms of world space distances. But we are not dealing in world space; we are in model space. And model space distances are, naturally, in model space, which may well be scaled relative to world space. Here, any kind of scale in the model-to-world transform is a problem, not just non-uniform scales. Although if there was a uniform scale, we could apply theoretically apply the scale to the attenuation constant. So now we cannot use model space. Fortunately, camera space is a space that has the same scale as world space, just with a rotation/translation applied to it. So we can do our lighting in that space. Doing it in camera space requires computing a camera space position and passing it to the fragment shader to be interpolated. And while we could do this, that's not clever enough. Is not there some way to get around that? Yes, there is. Recall gl_FragCoord, an intrinsic value given to every fragment shader. It represents the location of the fragment in window space. So instead of transforming from model space to camera space, we will transform from window space to camera space. The use of this reverse-transformation technique here should not be taken as a suggestion to use it in all, or even most cases like this. In all likelihood, it will be much slower than just passing the camera space position to the fragment shader. It is here primarily for demonstration purposes, and because it will be useful in the future. The normalized device coordinate position. The X and Y values passed to glViewport. The width and height passed to glViewport. The depth near and far values passed to glDepthRange. The Fragment Attenuation tutorial performs per-fragment attenuation, both with linear and quadratic attenuation. This tutorial controls as before, with the following exceptions. The O and U keys increase and decrease the attenuation constant. However, remember that decreasing the constant makes the attenuation less, which makes the light appear brighter at a particular distance. Using the shift key in combination with them will increase/decrease the attenuation by smaller increments. The H key swaps between the linear and quadratic interpolation functions. The drawing code is mostly the same as we saw in the per-vertex point light tutorial, since both this and that one perform lighting in camera space. The vertex shader is also nothing new; passes the vertex normal and color to the fragment shader. The vertex normal is multiplied by the normal matrix, which allows us to use non-uniform scaling. The lightAttenuation uniform is just a float, but bUseRSquare uses a new type: boolean. GLSL has the bool type just like C++ does. The true and false values work just like C++'s equivalents. Where they differ is that GLSL also has vectors of bools, called bvec#, where the # can be 2, 3, or 4. We do not use that here, but it is important to note. The integer form of uniform uploading is used, but the floating-point form could be allowed as well. The number 0 represents false, and any other number is true. The UnProjection uniform block contains data that only changes when the window changes. This uniform block is updated along with the vertex shader's Projection block. This data is used to perform the previously-discussed reverse-transformation operation, so that we can turn gl_FragCoord into a camera-space position. Notice that the windowSize uses a new type: ivec2. This is a 2-dimensional vector of integers. Not unsurprisingly, GLSL functions are defined much like C and C++ functions. The first three lines compute the position in normalized device coordinates. Notice that the computation of the X and Y coordinates is simplified from the original function. This is because our viewport always sets the lower-left position of the viewport to (0, 0). This is what you get when you plug zeros into that equation. The gl_DepthRange variable is a special uniform defined by GLSL for fragment shaders. As the name suggests, it properly mirrors the values passed to glDepthRange; this way, we do not have to put it in our uniform block. After the transformation to NDC space, we compute the clip-space position as previously shown. Then the result is multiplied through the clip-to-camera matrix, and that vector is returned to the caller. This is a simple function that uses only uniforms to compute a value. It takes no arguments. The second function is not quite as simple. The function header looks rather different from the standard C/C++ function definition syntax. Parameters to GLSL functions are designated as being inputs, outputs, or inputs and outputs. Parameters designated with in are input parameters. Functions can change these values, but they will have no effect on the variable or expression used in the function call. This is much like the default in C/C++, where parameter changes are local. Naturally, this is the default with GLSL parameters if you do not specify a qualifier. Parameters designated with out can be written to, and its value will be returned to the calling function. These are similar to non-const reference parameter types in C++. And just as with reference parameters, the caller of a function must call it with a real variable (called an “l-value”). And this variable must be a variable that can be changed, so you cannot pass a uniform or shader stage input value as this parameter. However, the initial value of parameters declared as outputs is not initialized from the calling function. This means that the initial value is uninitialized and therefore undefined (ie: it could be anything). Because of this, you can pass shader stage outputs as out parameters. Recall that shader stage output variables can be written to, but never read from. Parameters designated as inout will have its value initialized by the caller and have the final value returned to the caller. These are exactly like non-const reference parameters in C++. The main difference is that the value is initialized with the one that the user passed in, which forbids the passing of shader stage outputs as inout parameters. This particular function is semi-complex, as an optimization. Previously, our functions simply normalized the difference between the vertex position and the light position. In computing the attenuation, we need the distance between the two. And the process of normalization computes the distance. So instead of calling the GLSL function to normalize the direction, we do it ourselves, so that the distance is not computed twice (once in the GLSL function and once for us). The second line performs a dot product with the same vector. Remember that the dot product between two vectors is the cosine of the angle between them, multiplied by each of the lengths of the vectors. Well, the angle between a vector and itself is zero, and the cosine of zero is always one. So what you get is just the length of the two vectors times one another. And since the vectors are the same, the lengths are the same. Thus, the dot product of a vector with itself is the square of its length. To normalize a vector, we must divide the vector by it's length. And the length of lightDifference is the square root of lightDistanceSqr. The inversesqrt computes 1 / the square root of the given value, so all we need to do is multiply this with the lightDifference to get the light direction as a normalized vector. This value is written to our output variable. The next line computes our lighting term. Notice the use of the ? : operator. This works just like in C/C++. If we are using the square of the distance, that's what we store. Otherwise we get the square-root and store that. The assumption in using ? : here is that only one or the other of the two expressions will be evaluated. That's why the expensive call to sqrt is done here. However, this may not be the case. It is entirely possible (and quite likely) that the shader will always evaluate both expressions and simply store one value or the other as needed. So do not rely on such conditional logic to save performance. After that, things proceed as expected. Function calls appear very similar to C/C++, with the exceptions about parameters noted before. The camera-space position is determined. Then the light intensity, modified by attenuation, is computed. From there, things proceed as before. As nice as these somewhat-realistic attenuation schemes are, it is often useful to model light attenuation in a very different way. This is in no way physically accurate, but it can look reasonably good. We simply do linear interpolation based on the distance. When the distance is 0, the light has full intensity. When the distance is beyond a given distance, the maximum light range (which varies per-light), the intensity is 0. Note that “reasonably good” depends on your needs. The closer you get in other ways to providing physically accurate lighting, the closer you get to photorealism, the less you can rely on less accurate phenomena. It does no good to implement a complicated sub-surface scattering lighting model that includes Fresnel factors and so forth, while simultaneously using a simple interpolation lighting attenuation model.